In its Winter Forecast, the European Commission expects economic growth in Europe to continue at a moderate pace across Europe (there are of course regional differences); employment is growing at a robust pace and unemployment continues to fall, although it remains above pre-crisis levels. Private consumption is still the engine of the recovery. Investment growth continues but remains subdued. In its Winter Forecast, the European Commission expects GDP growth in the EU as a whole to moderately grow at 1.8% this year and next (Autumn Forecast: 2017: 1.6%, 2018: 1.8%). The pacesetters are Ireland (2017: 3.4%, 2018: 3.3%), and catching-up Central Eastern European economies such as Romania (2017: 4.4%, 2018: 3.7%), Hungary (2017: 3.5%, 2018: 3.2%) and Poland (2017: 3.2%, 2018: 3.1%). Western European economies which are having above-average GDP growth include Sweden (2017: 2.4%, 2018: 2.1%), and Spain (2017: 2.3%, 2018: 2.1%). With the exception of Italy (2017: 0.9%, 2018: 1.1%) and partially of Finland (2017: 1.2%, 2018: 1.5%) that still exhibit a lowish GDP growth, the other EU countries will record a growth of 1.5% at a minimum. 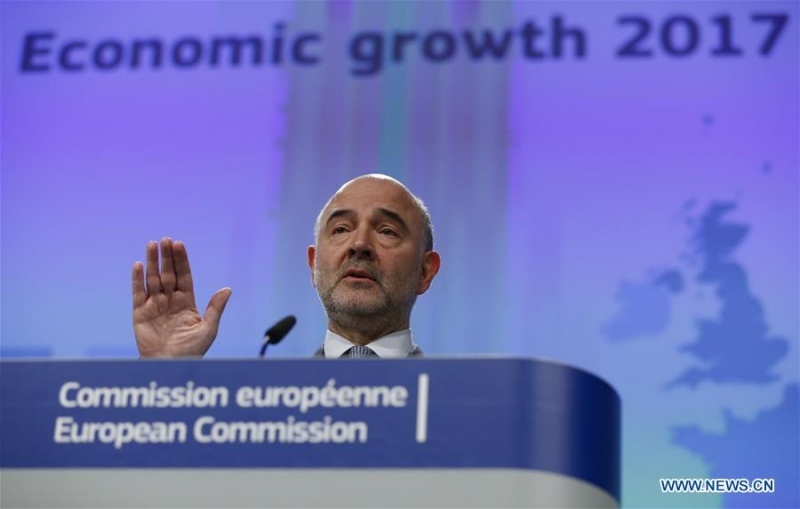 Germany and France are showing moderate growth, with growth figures around the EU average. UK is set to grow at 1.5% this year but uncertainties remain for the future due to Brexit. The announced fiscal stimulus of the new Trump administration has resulted in an appreciation of the dollar, which will make EU exports more competitive and in higher long-term interest rates; the economic situation in Russia looks improving, bolstered by a higher oil price (with crude oil hovering around 55$ per barrel) and the Kremlin looks set to record its first GDP growth since 2014. Emerging markets in general are expected to do better than last year, which could give a boost to European exports of both goods and services following a weak 2016. Volatile price oils, tense international situations and the exceptional European Central Bank (ECB) monetary stimulus which will slowly be phased out are all factors that may negatively impact on an otherwise moderately positive picture. The negotiations connected to the exit of the UK from the EU and elections in big countries such as France and Germany also add uncertainty as well as the new, trade-hostile, posture of the US administration and a rising Chinese debt. Going into more detail, private consumption is set to remain the main growth driver, supported by sustained improvements in employment and a rise in nominal wage growth. However, with inflation rising and limiting the growth of household purchasing power this year and next, private consumption growth is expected to slow. Investment is set to continue growing but only moderately, supported by a number of factors such as very low financing costs and strengthening global activity. figures since 2009 but remain above pre-crisis levels. Unemployment remains high in the Mediterranean countries (Greece and Spain still above 20%, France and Italy double-digit figures) and particularly low in Czech Republic, Hungary, Austria, Norway and Sweden. Inflation in the euro area has recently picked up as the past drop of energy prices has recently given way to an increase. Having been very low over the past two years, inflation is now set to reach higher levels this year and next, though still short of the target of “below, but close to 2% over the medium term” defined as price stability by the ECB. In the EU, inflation is forecast to rise from 0.3% in 2016 to 1.8% in 2017 and 1.7% in 2018. The aggregate euro area public deficit and the government debt-to-GDP ratio are expected to fall further in 2017 and 2018. The public deficit for the euro area is expected to decline from 1.7% of GDP last year to 1.4% in 2017 and 2018. This decline reflects lower interest spending due to exceptionally low interest rates. It also reflects further improvements in the labour market: more people are paying taxes and contributions, and fewer are receiving social transfers. The debt-to-GDP ratio is expected to diminish gradually from 91.5% in 2016 to 90.4% in 2017 and 89.2% in 2018. The burden of public debt remains on the shoulders of Mediterranean countries such as Greece, Italy and Portugal, and also of Belgium and France while debt in Germany, the Netherlands and Ireland is on a declining path. Instead, debt is on the rise in Finland and Poland though it will remain at not too worrying levels (respectively 65% of GDP, and 53%). Finally, Central European countries such as Germany, Switzerland and the Netherland have a huge trade of goods surplus with values reaching 10% of GDP, which the Commission reckons can pose problems as it creates imbalances. Ireland is an outlier with a surplus exceeding 40%. Massive importers include the UK, and South-Eastern European countries such as Greece, Croatia, Romania, and Bulgaria.